No such thing as a world without lawyers, so we've come up with a long and extremely boring text, but you accept these terms when you access our site, so you might as well get a cup of coffee and start reading! This website is offered to you, the user, conditioned on your acceptance without modification of the terms, conditions, and notices contained herein. Your use of this website constitutes your agreement to all such terms, conditions, and notices. (iii) take any action that imposes, or may impose, in the discretion of STAMPCOLLECTIOCENTER.COM, an unreasonable or disproportionately large load on the STAMPCOLLECTIOCENTER.COM infrastructure; or (iv) deep-link to any portion of this website (including, without limitation, the purchase path) for any purpose without express written permission of STAMPCOLLECTIOCENTER.COM. All contents of this website are: © POSTZEGEL PARTIJEN CENTRALE H/0. All Rights Reserved. All logos, design elements and the Star/Sun Symbol are registered trademarks or trademarks of POSTZEGEL PARTIJEN CENTRALE H/O. Other product and company names mentioned herein may be the trademarks of their respective owners. THE INFORMATION, SOFTWARE, PRODUCTS, AND SERVICES PUBLISHED ON THIS WEBSITE MAY INCLUDE INACCURACIES OR TYPOGRAPHICAL ERRORS. IN PARTICULAR, STAMPCOLLECTIOCENTER.COM AND ITS AFFILIATES DO NOT GUARANTEE THE ACCURACY OF, AND DISCLAIM LIABILITY FOR INACCURACIES RELATING TO DESCRIPTIONS, OTHER PRODUCT DESCRIPTIONS DISPLAYED ON THIS WEBSITE. STAMPCOLLECTIOCENTER.COM, ITS AFFILIATES, AND/OR THEIR RESPECTIVE SUPPLIERS HEREBY DISCLAIM ALL WARRANTIES AND CONDITIONS WITH REGARD TO THIS INFORMATION, SOFTWARE, PRODUCTS, AND SERVICES, INCLUDING ALL IMPLIED WARRANTIES AND CONDITIONS OF MERCHANTABILITY, FITNESS FOR A PARTICULAR PURPOSE, TITLE, AND NONINFRINGEMENT. STAMPCOLLECTIOCENTER.COM AND ITS AFFILIATES ARE NOT LIABLE FOR THE ACTS, ERRORS, OMISSIONS, REPRESENTATIONS, WARRANTIES, BREACHES OR NEGLIGENCE OF ANY ADVERTISER AND THIRD PARTY OR FOR ANY PERSONAL INJURIEIS, DEATH, PROPERTY DAMAGE, OR OTHER DAMAGES OR EXPENSES RESULTING THEREFROM. STAMPCOLLECTIOCENTER.COM AND ITS AFFILIATES HAVE NO LIABILITY AND WILL MAKE NO REFUND IN THE EVENT OF ANY DELAY, CANCELLATION, STRIKE, FORCE MAJEURE OR OTHER CAUSES BEYOND THEIR DIRECT CONTROL, AND THEY HAVE NO RESPONSIBILITY FOR ANY ADDITIONAL EXPENSE, OMISSIONS, DELAYS, RE-ROUTING OR ACTS OF ANY GOVERNMENT OR AUTHORITY. IN NO EVENT SHALL STAMPCOLLECTIOCENTER.COM, ITS AFFILIATES, AND/OR THEIR RESPECTIVE SUPPLIERS OR ADVERTISERS BE LIABLE FOR ANY DIRECT, INDIRECT, PUNITIVE, INCIDENTAL, SPECIAL, OR CONSEQUENTIAL DAMAGES ARISING OUT OF, OR IN ANY WAY CONNECTED WITH, THE USE OF THIS WEBSITE OR WITH THE DELAY OR INABILITY TO USE THIS WEBSITE, OR FOR ANY INFORMATION, SOFTWARE, PRODUCTS, AND SERVICES OBTAINED THROUGH THIS WEBSITE, OR OTHERWISE ARISING OUT OF THE USE OF THIS WEBSITE, WHETHER BASED ON CONTRACT, TORT, STRICT LIABILITY, OR OTHERWISE, EVEN IF STAMPCOLLECTIOCENTER.COM, ITS AFFILIATES, AND/OR THEIR RESPECTIVE SUPPLIERS HAVE BEEN ADVISED OF THE POSSIBILITY OF DAMAGES. BECAUSE SOME STATES/JURISDICTIONS DO NOT ALLOW THE EXCLUSION OR LIMITATION OF LIABILITY FOR CONSEQUENTIAL OR INCIDENTAL DAMAGES, THE ABOVE LIMITATION MAY NOT APPLY TO YOU. This website may contain hyperlinks to websites operated by parties other than STAMPCOLLECTIOCENTER.COM. Such hyperlinks are provided for your reference only. STAMPCOLLECTIOCENTER.COM does not control such websites and is not responsible for their contents or your use of them. STAMPCOLLECTIOCENTER.COM’s inclusion of hyperlinks to such websites does not imply any endorsement of the material on such websites or any association with their operators. Any software that is made available to download from this website ("Software") is the copyrighted work of STAMPCOLLECTIONCENTER.COM, its affiliates, and/or their suppliers and advertisers. Your use of the Software is governed by the terms of the end user license agreement, if any, which accompanies, or is included with, the Software ("License Agreement"). You may not install or use any Software that is accompanied by or includes a License Agreement unless you first agree to the License Agreement terms. For any Software not accompanied by a License Agreement, STAMPCOLLECTIONCENTER.COM hereby grants to you, the user, a personal, nontransferable license to use the Software for viewing and otherwise using this website in accordance with these terms and conditions and for no other purpose. Please note that all Software, including, without limitation, all HTML code and Active X controls contained on this website, is owned by STAMPCOLLECTIONCENTER.COM, its affiliates, and/or their suppliers, and is protected by copyright laws and international treaty provisions. Any reproduction or redistribution of the Software is expressly prohibited by law, and may result in severe civil and criminal penalties. Violators will be prosecuted to the maximum extent possible. You acknowledge that the Software and any accompanying documentation and/or technical information are subject to applicable export control laws and regulations of the US. You agree not to export or re-export the Software, directly or indirectly, to any countries that are subject to US export restrictions. The tax charge on STAMPCOLLECTIONCENTER.COM is a recovery of all applicable transaction taxes that STAMPCOLLECTIONCENTER.COM affiliates pay to the vendors in connection with your product purchase, when applicable. STAMPCOLLECTIONCENTER.COM is not the vendor collecting and remitting said tax to the applicable tax authorities. The vendors bill all applicable taxes to STAMPCOLLECTIONCENTER.COM affiliates. Taxability and the appropriate tax rate vary greatly by location. Affiliates actual tax cost paid to the vendor may vary from the tax recovery charge, depending upon the rates, taxability, etc. in effect at the time of the actual use of the product or service by our customer. Delivery of goods will take place within 30 days. All risk is of goods is with Stamp Collection Center until delivery of goods has taken place. Customer has the right to cancel the order within 14 days of delivery. 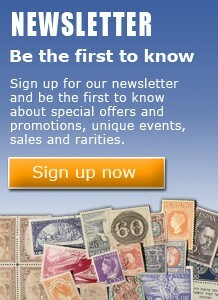 These fees, when applicable, cover the costs incurred by STAMPCOLLECTIONCENTER.COM or it's affiliates in servicing you. STAMPCOLLECTIONCENTER.COM reserves the right to change the terms, conditions, and notices under which this website is offered and you agree to accept and be bound by those terms, conditions, and notices that are in effect at the time of your use of STAMPCOLLECTIONCENTER.COM website and facilities. This agreement is governed by US law. You hereby consent to the exclusive jurisdiction and venue of the US courts in all disputes arising out of or relating to the use of this website. Use of this website is unauthorized in any jurisdiction that does not give effect to all provisions of these terms and conditions, including, without limitation, this paragraph. You agree that no joint venture, partnership, employment, or agency relationship exists between you and STAMPCOLLECTIONCENTER.COM as a result of this agreement or use of this website. STAMPCOLLECTIONCENTER.COM performance of this agreement is subject to existing laws and legal process, and nothing contained in this agreement is in derogation of STAMPCOLLECTIONCENTER.COM's right to comply with law enforcement requests or requirements relating to your use of this website or information provided to or gathered by STAMPCOLLECTIONCENTER.COM with respect to such use. This agreement (and any other terms and conditions referenced herein) constitutes the entire agreement between the customer and STAMPCOLLECTIONCENTER.COM with respect to this website and it supersedes all prior or contemporaneous communications and proposals, whether electronic, oral, or written, between the customer and STAMPCOLLECTIONCENTER.COM with respect to this website. A printed version of this agreement and of any notice given in electronic form shall be admissible in judicial or administrative proceedings based upon or relating to this agreement to the same extent and subject to the same conditions as other business documents and records originally generated and maintained in printed form. Fictitious names of companies, products, people, characters, and/or data mentioned herein are not intended to represent any real individual, company, product, or event. You warrant that you are at least 18 years of age and possess the legal authority to enter into this agreement and to use this website in accordance with all terms and conditions herein. You agree to be financially responsible for all of your use of this website (as well as for use of your account by others, including, without limitation, minors living with you). You agree to supervise all usage of this website by minors under your name or account. You also warrant that all information supplied by you or members of your household in using this website is true and accurate. Without limitation, any speculative, false, or fraudulent use is prohibited. You understand that overuse or abuse of our website and/or server capacity may result in you being denied access to such facilities.